Like other ceramic dishes, your Castlemere, Melia ceramic dog bowls and others may be very sturdy and less harmful to your pets. However, you still have some worries to concern about. How often do you wash your pet’s dishes? Just try to recall it! The importance of washing your pet’s dishes is as crucial as yours. If you don’t want to eat on a dirty plate, then how about your pets? It is the same! The bacteria will attack their digest system and make them sick. Even though you have luxurious and high-quality pet ware like Melia ceramic dog bowls, it doesn’t mean this can guarantee your pets’ safety. Yes, we understand that the ceramic coated pet ware is designed to be non-reactive so the chemicals will not contaminate the food. But, a bacteria is a bacteria, this matters and you should keep them clean. So, how many times do we need to clean the dog bowls? Is enough to clean it once a day? How often you feed your pets will determine how many times you should wash the dishes. If you give them dry food, once a day probably is enough as long as the dog bowl is clean and dry. But when you often give the pet raw food, you must wash the bowl after every feeding. Your water bowl should be washed as well. Why should we wash the dish? Remember, your pets’ bowl is full of saliva, debris, dust and other dirt. stay fresh all the time to keep it’s healthy. Try a less scented detergent as well. Special for the outdoor bowls, you must clean it few times a day. These bowls get too much exposure from bugs, multi dog use which mean some possibilities of plague. Should we sanitize the dog bowl? Use a mild detergent to clean the dog bowls, but make sure you will not leave the residue. Once you do it, you will make the dog’s stomach upset. As you have done, just place the bowl inside so this would not get dirty again. Besides, never put the dish at the same place with yours because you will contaminate your dishes. If you are lazy to wash the bowl every day, just be sure to have some dog bowls in your home so you can exchange it. What is the best dog bowls to choose? Avoid plastic because the chemical is dangerous. Opt for the porcelain or stainless still instead if your purpose it for water and food. Just like the Melia ceramic dog bowls, you have good sturdiness from the material and it is easy to clean. 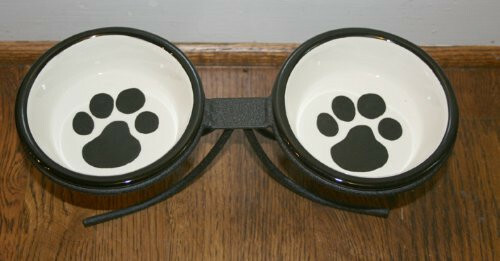 Most ceramic dog bowls feature oven and microwave safe so you can make a good food for your dog. Just keep in mind to use it well because when it is crack the pieces would be more harmful. Especially if you have dogs with the large tongue. They might get injured. Therefore, check regularly how the bowls condition before giving the food. Your dog cannot determine its bowl is broken or not. ← Double or Single Bowl Elevated Dog Feeder? Which One?